Before you get your enjoy your brand new personal water craft, or PWC for short, you have to get it into the water. Magneta Trailers is here so you can haul your pwc into the water with no worries. We have a variety of pwc trailers for sale ranging from a single and dual pwc trailer up to a triple pwc trailer. So whether you are enjoying a holiday weekend off from work or you are taking the family to the lake, we have what you need to get everything safely from your home into the water. 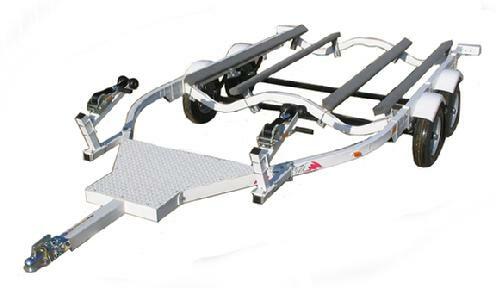 Most of our pwc trailers for sale come in two color options, white or galvanized. Choose galvanized for a sleek rust proof finish or white for a classic marina look. Either way, you are getting a high quality, durable and constructed with hot dipped galvanized steel tubes. Going out on the lake by yourself is fun but having a companion is a blast. If you have two jet skis or you want to take someone with you on a trip, a double jet ski trailer will easily haul both crafts and will save gas and time. 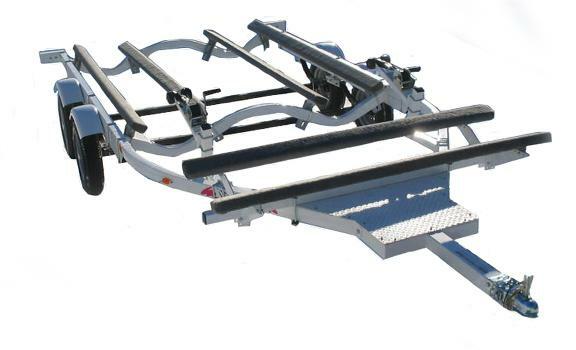 Purchasing a dual pwc trailer you purchase from Magneta Trailers may be the best decision you make aside from getting a pwc in the first place! #UPWC1 TRAILER COMES STD. 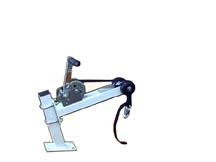 WITH EITHER THE VERTICAL PIN OR HORIZONTAL PIN BOW STOP. * 3"x3" x 2"x3" 14 GA. SQUARE STEEL TUBE CONSTRUCTION HOT DIPPED GALVANIZED. * 13 FT LONG 68" WIDE. * 480X12B 4 PLY TIRES, 1500 LBS G.V.W. #UPWC2SU DOUBLE NARROW WIDTH PWC TRAILER. * 2"X3" & 2"X2" 14 GA. SQUARE STEEL TUBE CONSTRUCTION HOT DIPPED GALVANIZED. * 12 FT LONG 65" WIDE. * 578X8 C 6 PLY TIRES, 1500 LBS G.V.W. * 2" COUPLER, MARINE LIGHTS. * STD TIRES 570X8D 6 PLY TIRES. * STD. VERTICAL PIN OR HORIZONTAL PIN BOWS STOPS. * ADJUSTABLE TONGUE, CAN BE STORED VERTICALLY WITH THE VTS1 VERTICAL STAND KIT. #UPWC2NW DOUBLE NARROW WIDTH PWC TRAILER ALLOWS FOR 2 PWC'S TO FIT THROUGH A NORMAL GARGE DOOR. * 3"X3" & 2"X3" 14 GA.SQUARE STEEL TUBE CONSTRUCTION HOT DIPPED GALVANIZED. * 3"x3" & 2"x3" 14 GA. STEEL SQUARE TUBE CONSTRUCTION HOT DIPPED GALVANIZED. * 15 FT LONG 100" WIDE. #UPWC3LPTD TANDEM AXLE 3 PLACER PWC TRAILER, SAME AS THE #UPWC2LPTD BUT WITH 3RD SPOT UP FRONT FOR SMALL SIT DOWN OR STAND UP PWC.